2013 Best Design of TIPA Awards GIOTTO’S IND. INC.
Tripod portability is always an issue and an occasional hindrance to use, a situation that this new series from Giotto addresses with a new centre column concept. The key is the new Y-Tube centre column that is designed to be 30% more compact when folded and lighter when compared to similar models. The main benefit of this new design is that legs can be folded in a more compact way than in traditional cylindrical columns designs. The new line of tripods are available in aluminum or carbon fibre builds. The Technical Image Press Association (TIPA) successfully celebrated the XXIII edition of the TIPA Awards Ceremony on 21 June 2013 in Tokyo, for the first time outside of Europe, in the Capitol Hotel Tokyu. Representatives of the winning companies were welcomed by members the TIPA board. 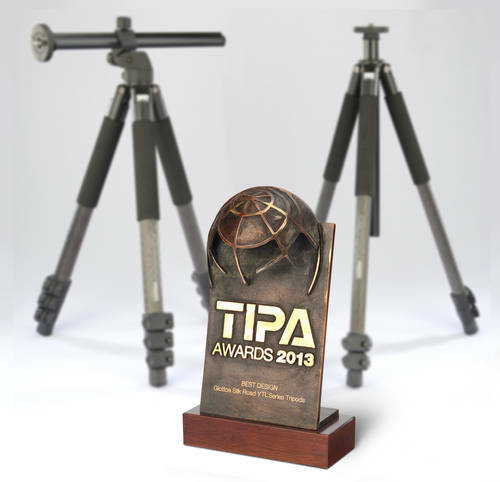 The winning products had been selected by the TIPA members in the annual meeting of TIPA, held on 20 April 2013 in Hong Kong. During the ceremony the bronze trophies, based on the new TIPA logo, were presented for the 40 winning products. At the TIPA annual meeting 27 member magazines and the Camera Journal Press Club (CJPC) of Japan had voted for the best product in 40 categories. TIPA now has member magazines from nine European countries plus Australia, Canada, China, India, South Africa and the USA. The CJPC of Japan and TIPA cooperate to vote for the best products for the TIPA awards and the Japanese Camera Grand Prix. TIPA was founded in Paris on 16 April 1991 as an association of European photo and imaging magazines. At the annual meeting in 2009, held in Budapest, Hungary, TIPA members voted to transform the association from European into a global organisation. With the world getting smaller, TIPA decided that the time had come to grow and strengthen its image and influence at an international level. With this decision, TIPA opened its membership doors to non-European members. TIPA is eager to be able to spread its message of enthusiasm and optimism about photography to a huge audience worldwide. For more information, please click here to access TIPA official site.